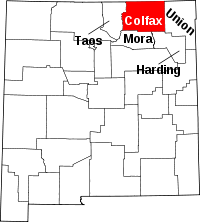 About half of Colfax County's 14,000 residents live in the county seat of Raton, NM. Also located there is the County Courthouse at 230 North 3rd Street. The courthouse is home to the office of the County Clerk, the local repository for most public records. The office is open Monday through Friday from 8:00AM until 5:00PM and welcomes researchers and visitors during those hours. While most public records are on file at the Clerk's office, birth and death records are not. Those are maintained by the New Mexico Department of Health in Albuquerque, however birth records dated more recently than 100 years, and death records dated more recently than 50 years are closed to the public. Since the department only started keeping vital records in 1920, that effectively means no birth records are open for research there, and only half of the death records are.